Do not be surprised if Cam Newton comes out of the locker room this weekend in a pink uniform, with pictures of Gloria Steinem on either side of his helmet. He may have to in order to get back in the good graces of the liberal sports media after the stunt he just pulled at a Panthers press conference. If you listen closely, you can hear the moment in which Newton realizes he made a tremendous mistake. 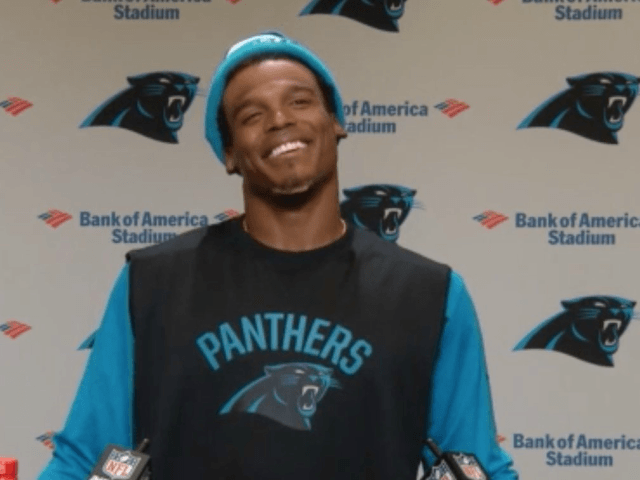 As a rich and famous celebrity athlete, I’m guessing Newton is used to other people laughing when he makes jokes. The silence that greeted him after that comment, had to have set off warning signs. Newton had just got back in the good graces of the liberal sports media, by raising a fist after scoring a touchdown against the Patriots last weekend. After this incident, Newton might have to read Das Kapital chapter and verse, from the press box. In the world of the liberal sports media, giving a female reporter the “little lady” treatment, is just about the worst thing you can do. What’s funny about the whole thing, though, is there are a lot of guys out there who feel the same way Newton does. They think it’s funny when a woman uses sports terminology to describe a game that she couldn’t play. Does that make them sexists? Not in the minds of people who don’t have giant portraits of Gloria Steinem in their living rooms, but Cam Newton isn’t surrounded by normal people. He’s surrounded by the sports media, and they will make him regret this, big time.